Description:According to a legend passed down by the Erie Indians, Manitou, the Great Spirit, led the tribe to the shores of an inland sea where they would find game in abundance and enjoy the cool, health-giving breezes coming from the land of snow and ice. One day, the Eries ventured into the great waters to discover where the sun sank in the evenings. This intrusion greatly angered the spirits of the lake who caused a terrible storm to build on the waters. Hearing the cries of his favored people, the Great Spirit stretched forth his left arm into the sea to protect his children from the turbulent water and allow then to paddle their canoes safely back to shore. Where the benevolent arm of the Great Spirit had blocked the waters, a vast sand bar formed which ever since has provided protection and a safe harbor to his favorite people, the Erie. Many nations have benefited from the protection provided by the arching sand bar located along Pennsylvanias Lake Erie shoreline, and the uniqueness of the peninsula, named Presque Isle or almost an island by the French, does make one wonder about its origins. The present white tower with its distinctive black band that is mounted on the outer end of the north pier forming the entrance to Presque Isle Bay and Erie Harbor has been guiding mariners since 1857. Known as Presque Isle North Pierhead Lighthouse or Erie Harbor Pierhead Light, the beacon has a design that is unique among surviving U.S. lighthouses. The lighthouse exhibited a fixed red light until 1995, when its fourth-order Fresnel lens was removed, and a modern flashing red light was installed in its place. The classic lens can now be seen at the Erie Maritime Museum. 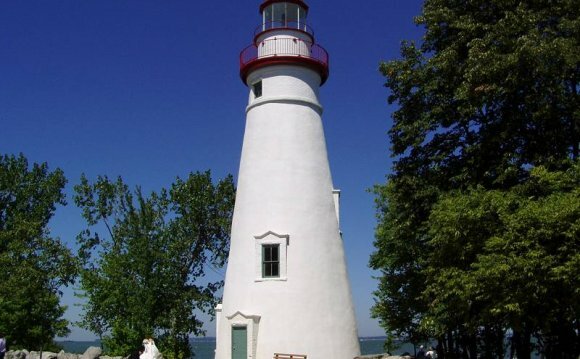 An inspection report of 1837 noted that Erie Harbor, which it called the largest and best to be found on Lake Erie,  was served by a lighthouse and a beacon. The lighthouse was Erie Land Lighthouse, which had been erected on a bluff overlooking the harbor in 1818, and the beacon was a light at the entrance to the bay that had just been established. In fact, Congress had appropriated 4 on March 3, 1837 for completing the beacon-light at the end of the pier which forms the entrance into the harbor of Erie. The 1837 report indicated that the beacon was so situated that it cannot be seen by vessels running down the lake until they are very close to it,  and thus recommended that vessels use the lighthouse to gain the upper entrance to the harbor and then follow the beacon light. In 1854, the wooden beacon light received a catadioptric apparatus of the sixth order, illuminating an arc of 270°,  which replaced the former apparatus that had be described as being very defective. The beacon light and its new sixth-order lens were destroyed the following year, when a vessel entering the harbor during a gale struck the tower. A lens lantern suspended from a gallows frame was displayed on the pier until a replacement tower could be built. An itemized cost sheet from 1855 records that $1, 731 was needed for the labor and materials to build up a new twenty-eight by thirty-three foot pierhead at Erie, Pennsylvania from two feet below the water to seven feet above. The estimated cost for plates, bolts, braces, stairs and railing to construct a two-story, cast-iron tower was $939, while $432 was the expected cost for the lantern. Painting was to run $215, freight $100, superintendence and labor for the tower and lantern another $900. After adding 10% for contingencies and $502 for a sixth-order Fresnel lens, the total cost for a new pierhead and beacon was an estimated $5, 250. The new Presque Isle North Pierhead Lighthouse commenced operation in 1857 and was similar to one built at the same time for Huron Harbor, Ohio. The iron tower stood twenty-six-and-a-half feet tall, and when originally built, the lower portion of the tower was open showing its spiral staircase, and only the watchroom beneath the lantern room was enclosed. In addition to the pierhead light, various range lights have served nearby to help mariners enter the harbor over the years. In 1854, the Lighthouse Board adopted range lights that had previously been privately maintained. An 1857 Light List shows that there were three range beacons in use at Erie: one on the west end of the pier and two on the peninsula northwest of the pier. In 1872, new octagonal frame towers were erected on the east and west ends of the recently extended pier to serve as a range for entering the harbor. At this time, the 1857 iron tower was on a crib behind the pier. A fog bell was established at the eastern end of the pier in 1880. In 1882, the iron tower was moved to the outer end of the pier, and the fog bell was placed in its base. The lights characteristic was changed from fixed white to fixed red at this time. An elevated walk, with a length of 934 feet, was built between the iron tower and the keepers dwelling in 1883. During the same year, the lenses in use at North Pierhead Lighthouse and at Crossover Island Lighthouse in New York were swapped, with the North Pierhead receiving a fourth-order lens and Crossover Island a sixth-order lens. The north pier was extended 450 feet during 1891, forcing the relocation of the iron tower and its fog bell and the addition of more elevated walk. The Lighthouse Board requested $4, 300 in 1890 for a steam fog signal to replace the fog bell, which was considered ineffective. The expenditure was approved in 1893, but no funds were actually allocated until later. Finally, in 1899, a fog signal building was built on the tip of Presque Isle Peninsula, about a mile-and-a-half north of the pierhead station, and a ten-inch steam whistle commenced operation on August 1 of that year, sounding a five-second blast every thirty seconds when needed. As the steam whistle was added to the responsibilities of the North Pierhead Station, a second assistant keeper was appointed, and in 1900 a new duplex was built for the head keeper and first assistant, while the second assistant was assigned to the old dwelling. Also in 1900, the fog bell was removed from the base of the iron tower and placed in an open framework structure at the end of pier, which had been extended 470 feet. The open framework structure had previously been used to exhibit a light on the pier at Dunkirk, New York. By 1911, a metal bell tower, with an enclosed upper portion and a square column that served as a drop tube for the weights that power the fog bell striking mechanism, had been placed east of the iron light tower. An allotment of $38, 500 was provided in 1923 to electrify the lights on the pierhead, to build a new compressed-air fog signal 500 feet east of the steam whistle, to erect a new steel tower for the western light on the pier, and to construct a new boathouse. Commercial electricity was supplied to the station via a submarine cable, but a generator was also installed in a new powerhouse at the station in case of a power failure.